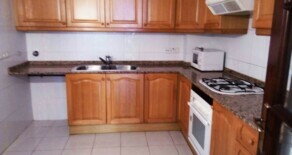 110 m2 exterior flat with three bedrooms, living room, kitchen with gallery and two bathrooms, one of them en-suite. It is very large, it was built in 1992 and it is in good condition with terrazzo floor, built-in wardrobes and air conditioner duct system. Very well located in Jesús neigbourhood center, next to the market, the underground station and Giorgeta avenue. For rent unfurnished and with garage space in the same building.